"Matured Golden Cavendish Tobaccos, Exceptionally Mild, Delightfully Aromatic." Smokers Discounts offers a classic smoke that’s been captivating the hearts of many since 1973. 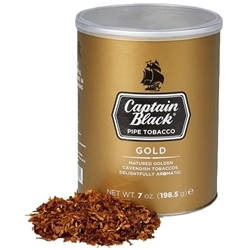 Captain Black Pipe Tobacco is one of the most profound blends in the world. Made of only the highest quality, hand-picked Burley, Cavendish and Virginia tobaccos, every Captain Black burns evenly and smoothly once ignited, finishing clean due to its loose cut. Make your choice today, make it Captain Black!